Cooking and baking are dangerous hobbies. One, because there are actually a lot of pointy and sharp things in my kitchen. I don't do well with pointy things. I actually passed out after cutting my thumb in sculpture class once. The wound required no more than a band-aid, but in my head I was convinced I was down a digit for sure. While unconscious I hallucinated about colorful monkeys and eventually came to in my very alarmed teacher's lap. So....not good with pointy things. There's that. There's also the deliciousness. 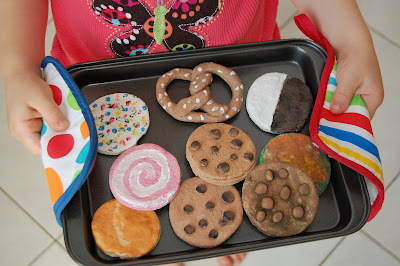 There are things out there full of flour, sugar, and butter and they are fun to make and fun to eat. But if you eat as your hobby you have to rename your website Egg & Reinforced Iron Crossbeam. And that doesn't have the same ring, does it? 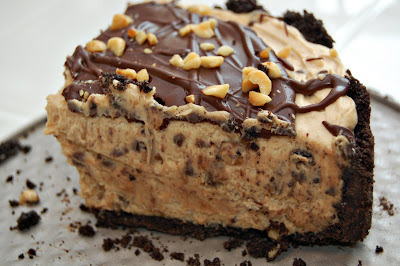 Oreo crust, fluffy peanut butter mousse filling studded with spiced peanuts and chocolate chips, bittersweet ganache topping and a sprinkling of peanuts. Oh yes. I had a blast making it and a blast enjoying it with some great people. Preheat oven to 350 degrees F. Butter a 9 1/2-inch springform pan. Toss 1/2 c. chopped peanuts, 2 tsp. sugar, espresso powder, cinnamon, nutmeg, and chocolate chips together in a bowl and set aside. Put the cookie crumbs, melted butter, and salt into another bowl and mix with a fork until the crumbs are moistened. Press the crumbs evenly over the bottom and up 2" on the sides of the springform pan. Freeze the crust for 10 minutes. Place the crust on a baking sheet (to catch drips) and bake on center rack for 10 minutes. Allow to cool completely. In the bowl of a stand mixer, whip 2 c. cream until it holds medium peaks. Beat in 1/4 c. confectioners' sugar and whip until the cream holds medium-firm peaks. Scrape the cream into another bowl or container and refrigerate. Wipe out the mixer bowl and beat the cream cheese with remaining 1 c. confectioners' sugar until satiny smooth. Beat in peanut butter, remaining 1/4 c. of the finely chopped peanuts, and milk. Using a large rubber spatula, gently fold in about one quarter of the whipped cream to lighten the mousse. Stir in the spiced peanut mixture, then gently fold in in the remaining whipped cream. Scrape the mousse into the crust, smooth the top, and refrigerate at least 4 hours, but preferably overnight. For the ganache topping: Place chocolate in a heatproof bowl. Bring 1/2 cream to a boil. Pour over chocolate chips, allow to sit for 30 seconds, then stir until smooth and glossy. 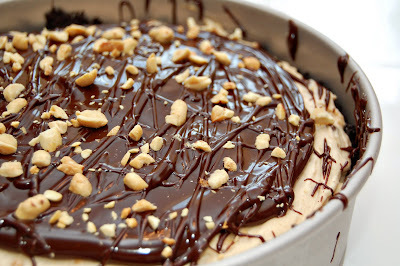 Allow to cool for a few minutes, then pour and spread over the top of the chilled torte, and sprinkle with chopped peanuts. Remove springform pan sides when ganache is firm, and refrigerate until ready to serve. Yum! 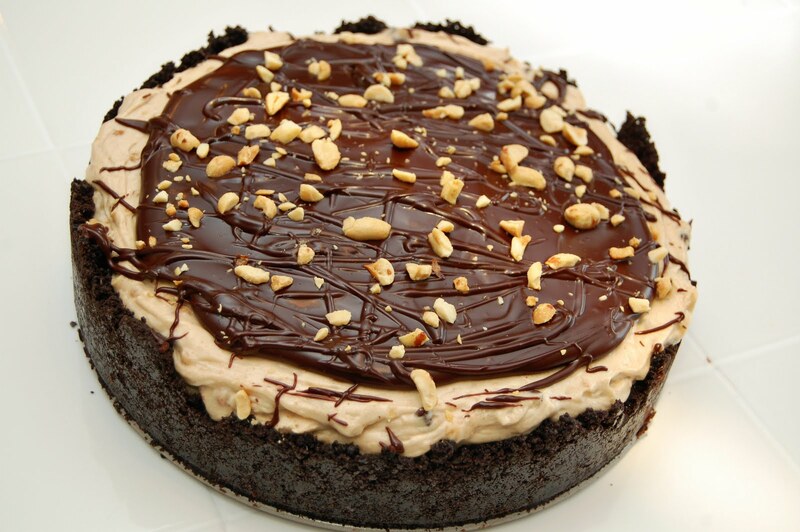 Peanut butter and chocolate...my favorite! Oh my! It looks so decadent, I could polish off several slices. My hubby is like that too, humph! 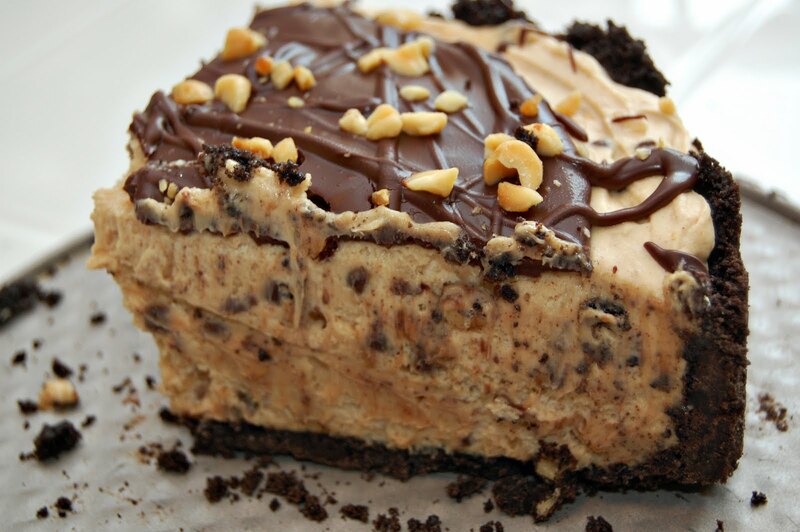 Chocolate and peanut butter, the best flavor combination in the world! Would love for you to share the recipe on my July 4th link party at CajunSugarPie.com! Haha, my husband is the same way. He works in food service and HAS to "graze" all day (he's responsible to make sure that everything tastes good before it's served). You would never know it though. OH, my! Be still my heart! This looks absolutely divine! How yummy! That torte sounds so tasty and I just love your pictures :) Every Wednesday I host a recipe swap and I'd love for you to come by and show off your gorgeous torte. Have a blessed day! oh my goodness! This looks delicious! and the pictures look amazing! Thanks for the recipe! I found your blog through a link party and LOVE it! I love finding blogs with great recipes! I am your newest follower and would love it if you would check out my blog and follow me too! Thanks! Yum! Peanut butter mousse torte= heaven! Great photos! ALl your recipes look fantastic! I'm your newest blog follower! This looks awesome. Would come over and share some of your recipes at my link party Cast Party Wednesday tomorrow? You had me at oreo crust! This looks so great! Maybe this will be my dessert for the fourth! I'm new to following your blog and look forward to all things you will share. Your torte looks rich, delicious and gorgeous! I have the same cookbook, but somehow missed this!?! A must-make! Oh my goodness. It's one in the morning, and I should be going to bed, but instead I'm looking at your delicious food and my stomach is grumbling - because, well, there's NOTHING better than chocolate! I (surprisingly!) have all the ingredients for this, and will totally be making it in the morning! 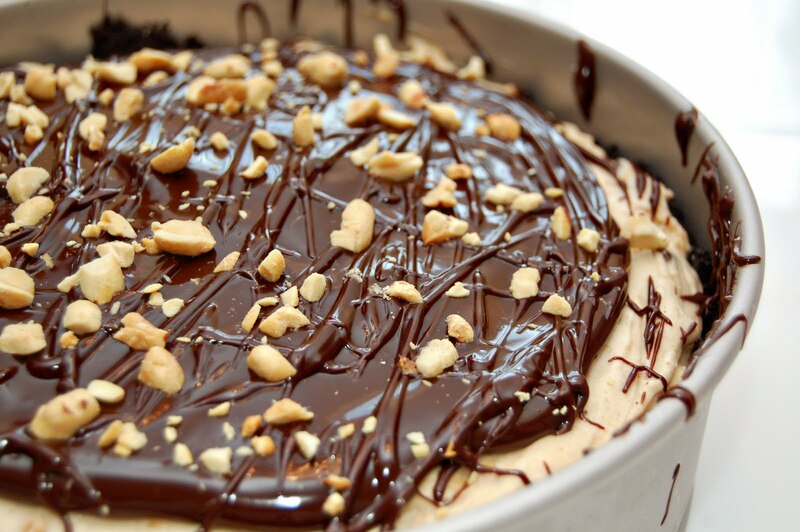 I love desserts with peanut butter and chocolate. Never tried this one, but it looks YUMMY! Thanks for sharing the recipe because it looks like a great one.